formation of or conversion into bone or a bony substance. ectopic ossification a pathological condition in which bone arises in tissues not in the osseous system and in connective tissues usually not manifesting osteogenic properties. endochondral ossification ossification that occurs in and replaces cartilage. intramembranous ossification ossification of bone that occurs in and replaces connective tissue. metaplastic ossification the development of bony substance in normally soft body structures; called also heterotrophic ossification. 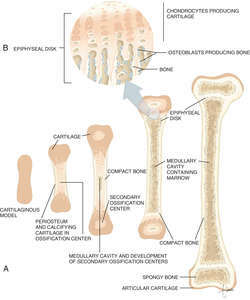 formation of osseous tissue by the replacement of calcified cartilage; long bones grow in length by endochondral ossification at the epiphysial cartilage plate where osteoblasts form bone trabeculae on a framework of calcified cartilage. The formation of bone in which a cartilage template is gradually replaced by a bone matrix, as in the formation of long bones or in osteoarthritic ossification of synovial cartilage. Bone formation occurring within cartilage, in which cartilage is replaced by bone. This is the main process of bone formation and extension during fetal life and childhood. Formation of osseous tissue by replacement of calcified cartilage.